I don't know about you, but the past few days have been full of Christmas shopping for us. Parker and I have knocked out all of our gifts for his entire family, and we are hoping to purchase my family's gifts while things are on major sale today! If you haven't started Christmas shopping yet, it would be a great idea to get started today while SO many retailers have fabulous sales going on! I am sharing quite a few things below that would make perfect Christmas gifts! In the first section, I am sharing My Best Sellers*. In the second section, I am sharing my picks from my 5 favorite retailers that are having amazing sales. And in the last section, I am sharing a list of other fabulous sales that are going on! *I always find it SO interesting when other bloggers share what people are buying through their links. So the first section below will have links to a few of my best sellers (which means the things that the most people have bought through my links) that are currently on sale. And like I have mentioned before- I can see when purchases are made through my links, but I never know who is doing the shopping. So if you are shopping through my links, THANK YOU, and I love nothing more than hearing from you! Also, I own and LOVE all of the things included in this list! The two pictures below show the coat (currently under $100 and free shipping!!!) and wedges (under $35) that are my top 2 best sellers. As well as the leggings and Free People thermal that are also in my top 10! GiGi New York is my favorite brand of handbags! All of their bags are made beautifully, and you can get personalization on everything. This makes their handbags the perfect gift. They rarely ever have sales, and you can get up to 35% off today. I will share pictures of my 2 favorite bags with you. The first one is the Madison Crossbody, which is the purse I carry daily. I cannot say enough positive things about it. I highly suggest it. The clutch in the second picture is the All in One Bag. I don't carry it nearly as much as the first one, but I do love it too. J.Crew is currently offering 40% off plus an additional 10% off plus free shipping! Use code SHOPFAST. 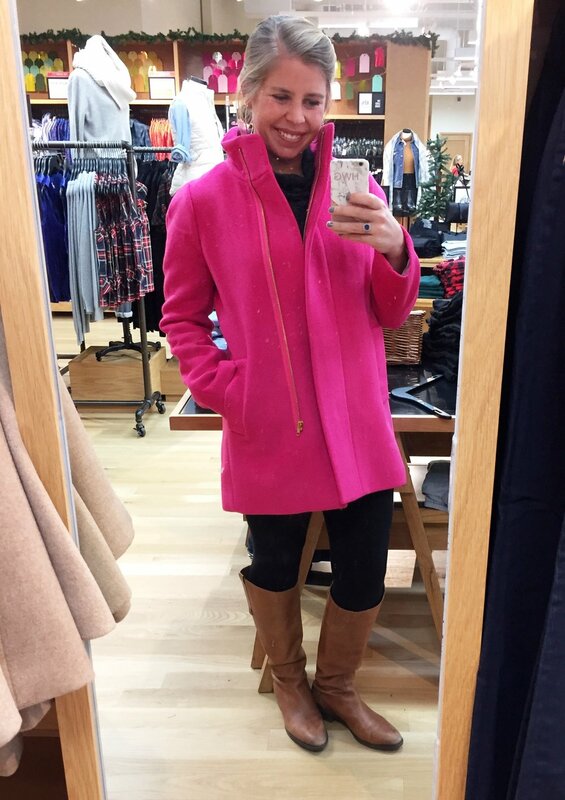 HURRY- this is amazing for J.Crew! I am wearing this coat in the picture below. J.Crew Factory is offering 50-60% off everything plus free shipping with code CYBER. You can also get 50% off of clearance with the same code. 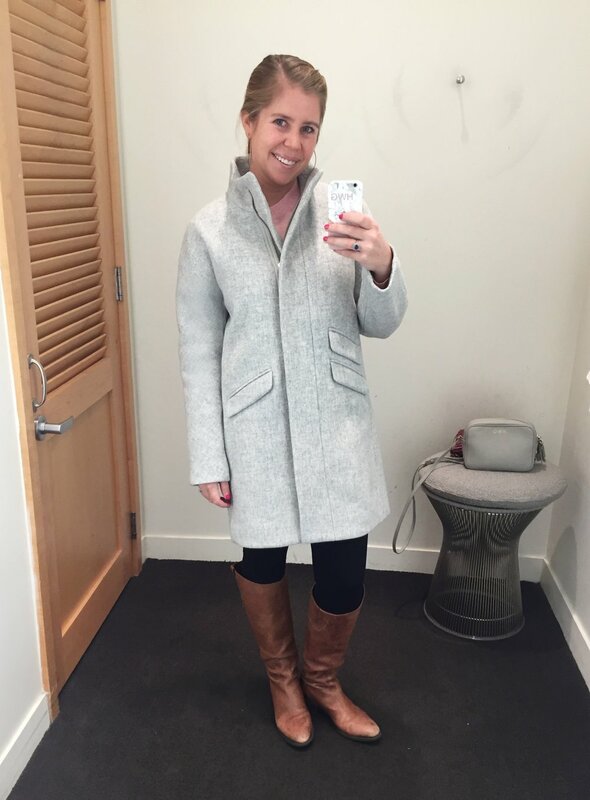 Do you think I like this coat (pictured below)? :) My mom got me this pink one on Black Friday, and it is now marked down to under $100 and ships free! Nordstrom is offering an extra 20% off select sale items and free shipping and returns as always. I'm sharing my top 10 picks below. And you can click here to see more of my Nordstrom sale picks. This $22 sweater and these $20 olive moto leggings are pictured below. BeautyCounter- My sister in law sells these amazing products, and Parker is ordering me one for Christmas! Now is the time to shop because of the Cyber Monday deals going on (deals pictured below)! Parker is getting me this Tint Skin Hydrating Foundation. I also think this Touchup Skin Concealer Pen looks amazing. And one day, I would love to invest in this Flawless in Five set. Shoes.com- Up to 75% off, Hunter Boots up to 40% off! Thanks so much for reading! I hope you take advantage of these fabulous deals! Have a wonderful day!